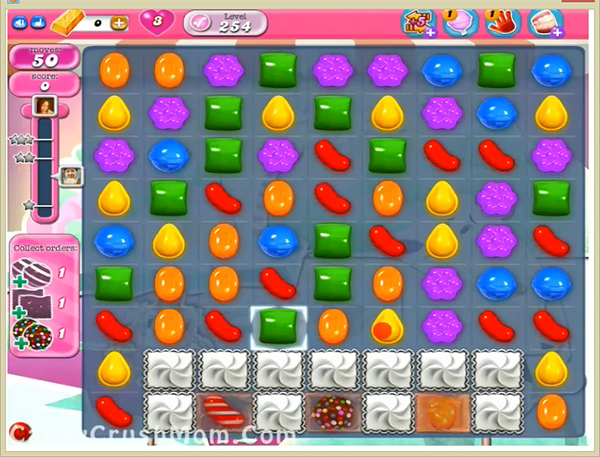 This level is just easy as you already completed lot of levels and making these special candies wont be hard for you. For this level you should first try to make colorbomb that you could get by combing five same color candies and its hard then other special candy. After try to make wrapped candy combo and then striped candy combo to reach order requirement easily. We completed this level with 153740 score using same above technique and got three star score and reach requirement before 9 moves. Sorry to say I do not have any Hands at this time. But I do have 2 Lollipops, but I do not see how they would help this level. It would be doable if Cascades could be Turned Off by the player. The problem is not making the Candy or Color Bombs, but getting them side by side or in the same column so you can combine them. And if King thinks we are going to pay for Boosters, they can forget it. The should be fun to play and winnable, ot annoying as it is now. I’ve been on this level forever. And I can’t seem to get off of it. I’ll get two of the combinations, but then I can’t get the third one. I realize that you have to have some hard levels, but why this hard? Whenever I look to see how to win this level, it always says to play the bottom, but that isn’t always possible. Try to make these levels easier to play.